I have nobody to blame for these blisters but myself. I can’t even remember how many times I’ve nagged my kinds about the importance of wearing proper shoes and socks when you go hiking – not to mention taking a decent supply of water when it’s over 90 degrees. The problem is, I didn’t intend to do any hiking. It was once of those strolls that sort of got out of hand and ended up lasting, oh, two hours or so. The day started out as a trip to the beach in the southern end of the Sleeping Bear Dunes National Lakeshore, a part of the park I don’t visit very often. I swam, I walked, I toasted a bit in the sun… and then I got bored and decided to follow a trail through the woods. But it turned out to be a really great trail, with lots of twists and turns through a landscape of narrow steep ridges and small lakes and marshes. And I really hate to turn around and go back the way I came when there might be something cool around the next corner. Just shouldn’t have done it in street shoes. But it got me thinking once again about how many times I hear people talking about how Sleeping Bear has gotten “too popular” and you can’t find any peace and quiet there anymore. So what&apos;s the story? Has Sleeping Bear been spoiled by it&apos;s success? It’s certainly true that visitor tallies have been rising steadily since 2010, when viewers of “Good Morning America” voted it the Most Beautiful Place in America. 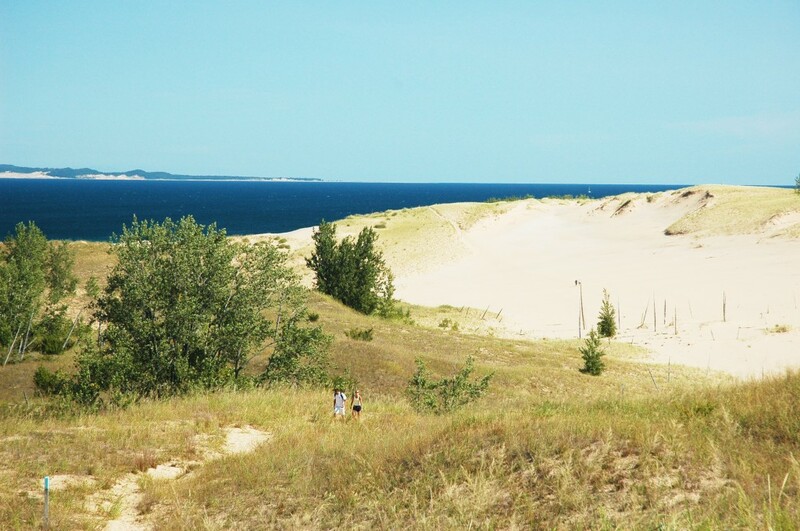 On peak summer weekends, that can clearly be seen at many of the park’s most visible attractions: crowds at the Dune Climb, full parking lots at North Bar Lake, slow going on the Pierce Stocking Scenic Drive. 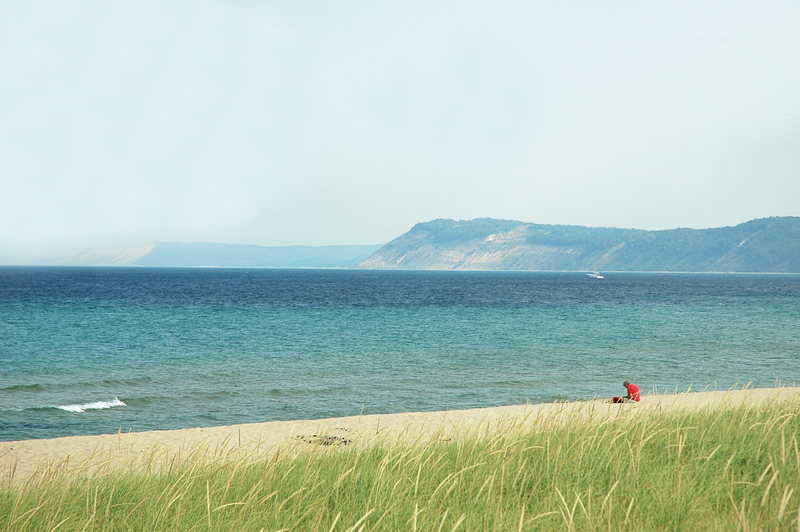 But there’s still plenty of solitude and mystery to be found at Sleeping Bear, if you know where to look. Or you can sit on a lonely beach, in sight of the Dunes. After all, the park encompasses 64 miles of Lake Michigan coastline, two islands, 26 inland lakes and more than 71,000 acres of land about a half hour’s drive west of the resort town of Traverse City. And since the overwhelming majority of visitors gravitate to a handful of high-visibility spots just south of Sleeping Bear Point, there are miles of nearly-empty beaches, almost 100 miles of hiking trails and thousands of acres of parkland where you can experience this beautiful place without any distractions. I admit that I no longer give away the locations of my favorite secluded beaches -- half the fun of finding a special place is taking the trouble to discover it for yourself. Still, the busiest spots in the park are in a small area between the villages of Empire and Glen Arbor. That leaves two enormous tracts of land – the Platte River District to the south and the Port Oneida/Good Harbor area to the north – that are relatively quiet even at the height of the summer season. There are popular beach hangouts in both areas, but you’ll fund that most people don’t venture very far from the parking lot. In most cases, a ten-minute stroll along the shore will give you all the serenity you want. In fact, the best thing to do if you’re searching for peace and quiet at the Sleeping Bear Dunes is to leave your car behind. Want to see a view that’s every bit as inspiring as the much-photographed overlook on the Scenic Drive? Go north to Pyramid Point and climb the half-mile trail up to the top of the bluff. (Even better, keep going and do the whole 2.7-mile loop; it’s a beauty.) Want to find an unspoiled beach with splendid vistas of the dunes? 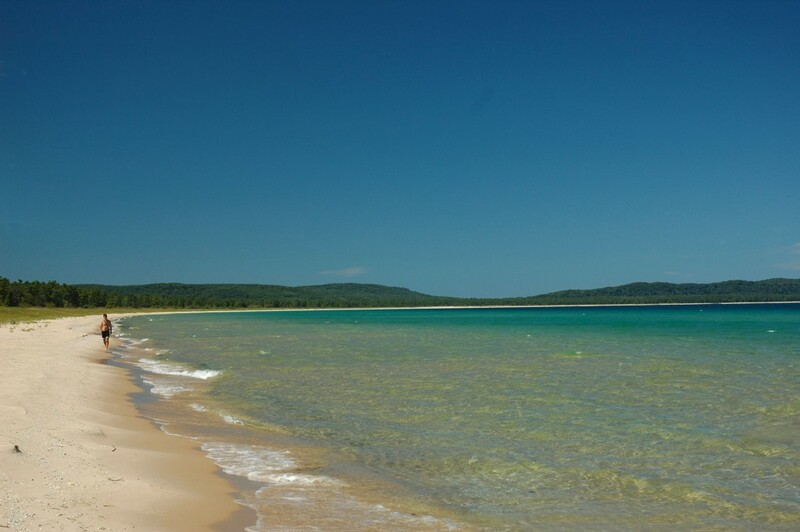 Explore the shoreline of Platte Bay on either side of the Peterson Road turnoff. 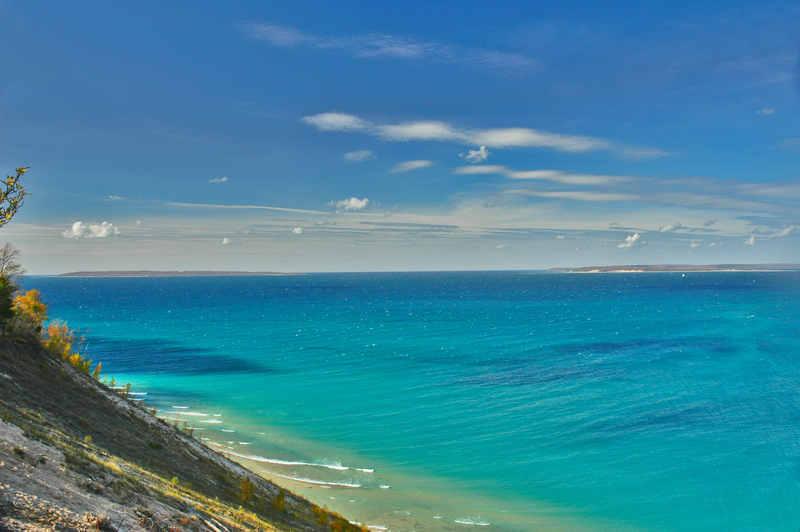 In fact, if you’re really determined to get away from it all, you need to jump on the ferryboat that takes visitors out to the Manitou Islands, the most remote and secluded part of the park. Day-trippers head for South Manitou to climb the lovely lighthouse, explore the small village near the docks, or wander along the shore to visit the grove of giant cedar trees and look for shipwrecks. 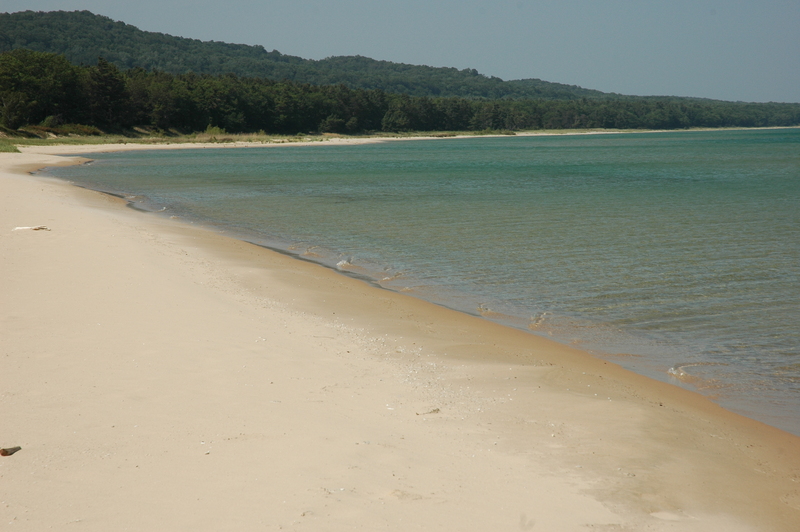 North Manitou is a federal wilderness area, and its only visitors are serious backpackers who come prepared to stay for several days. There aren’t a lot of amenities unless you count empty beaches, tall dunes, mysterious ruins and forests so deep they feel like something from Jurassic Park. But if you’re after solitude, this is definitely the place. But even the “high traffic” areas aren’t really that busy if you pick the right time to go there. The Pierce Stocking Scenic Drive is not a place to go for solitude on a summer weekend, but in midweek it’s pretty nice – and in spring and fall it can be downright deserted. Try the Sleeping Bear Point Trail with its dramatic changes in landscape, the Empire Bluff Trail with its sweeping views of the lake and shore, and the winding Crystal River’s serpentine “ridge and swale” topography. And instead of going in the middle of the day (when it’s hot and sticky anyway) think about morning and early evening. Those are the quiet times.